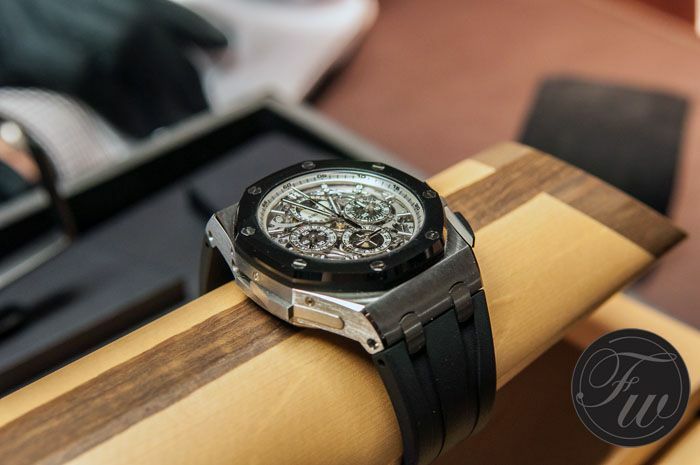 Audemars Piguet’s most popular collection is without a doubt the Royal Oak. Even more precise, the Royal Oak Offshore collection. This more sporty version of the traditional Royal Oak watches, was introduced in 1993. 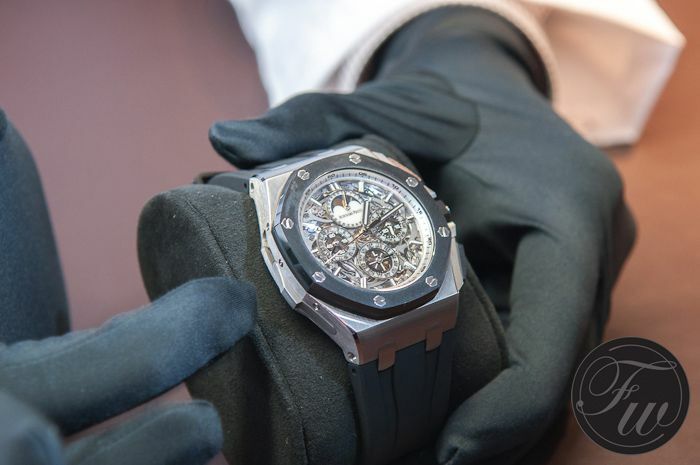 The Royal Oak Offshore chronographs and Offshore diving watches are the ones we already had seen in the past and now Audemars Piguet introduced the Royal Oak Offshore masterpiece: The Royal Oak Offshore Grande Complication in 44mm. This Grande Complication features a minute repeater, perpetual calendar, split-second chronograph, hours, minutes and small seconds. This watch is definitely not for the weak hearted watch enthusiasts out there. Especially the 44mm 18 carat pink gold case of the Offshore Grande Complication ref. 26571RO.OO.A010CA.01 will be a heavy watch to wear in every respect. However, as shown on the photo above, there will also be a titanium version of the Royal Oak Offshore Grande Complication, the ref. 26571IO.OO.A010CA.01. The differences in execution are very little but due to the use of different colours it appears to be a different watch. The pink gold version has white rubber chronograph pushers, a white rubber crown and the dial has pink gold hour markers. Also, the pink gold version comes on a white rubber strap. The titanium version is the one that we cover here on Fratellowatches. 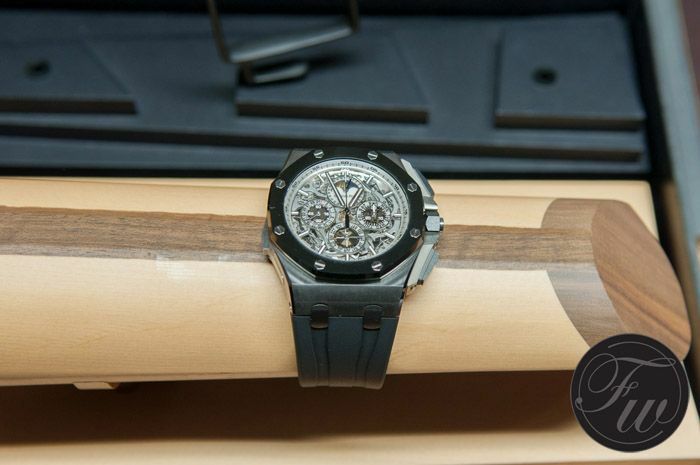 The wooden box of the Audemars Piguet Royal Oak Offshore Grande Complication is almost as impressive as the watch itself. A very large wooden box that contains a long round watch holder made out of (balsa?) wood. It has the same function as a soundboard of a guitar, in this case to amplify the sound of the minute repeater. The minute repeater is a complication that makes the horological heart tick faster. Operated by the slide on the left side of the Offshore case, as can be seen in the photo above. The movement of this watch, AP caliber 2885, consists of 648 parts and besides the minute repeater, features a perpetual calendar, split-second chronograph and of course hours, minutes and seconds. With a diameter of 31.6mm and a height of 8.95mm, this is quite a large movement. However, if you consider the fact that it has 648 parts and all these complications, it is still micro engineering of course. With complicated timepieces like this and the recently introduced Tradition Tourbillon Minute Repeater Chronograph Audemars Piguet clearly demonstrates they play in the highest league of fine watchmaking. 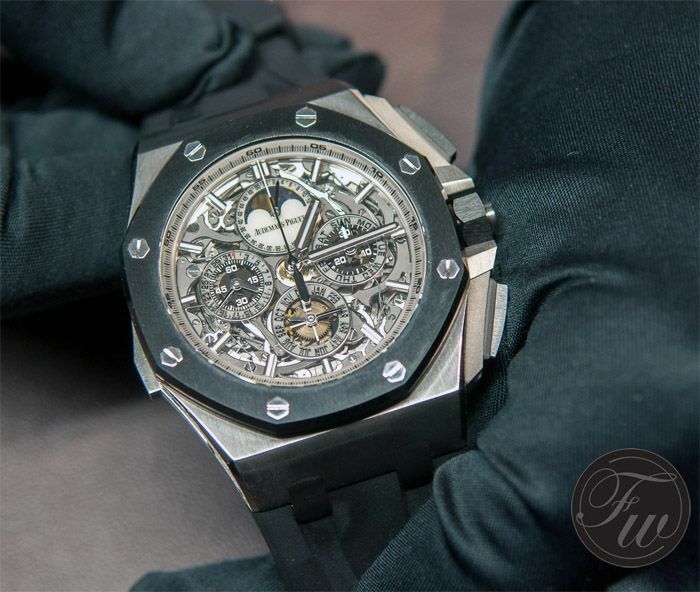 The Audemars Piguet Royal Oak (Offshore) is a luxury sports watch, it always has been. The fine combination of brushed and polished finish on case and bracelets does not allow you to use this watch for sports activities without having to shed some tears afterwards because your watch got scratched or dinged. The black ceramic is a welcome solution to prevent the octagonal bezel from scratching, but the biggest worry is about the case of course. The bezel is easier and cheaper to replace at some point. However, if you treat this AP Royal Oak Offshore Grande Complication nicely, it will be nice to you as well and will keep its fresh appearance. Another important feature of this ref. 26571IO.OO.A010CA.01 with respect to luxury is that there will only be three of them. The same goes for the pink gold ref. 26571RO.OO.A010CA.01 version. 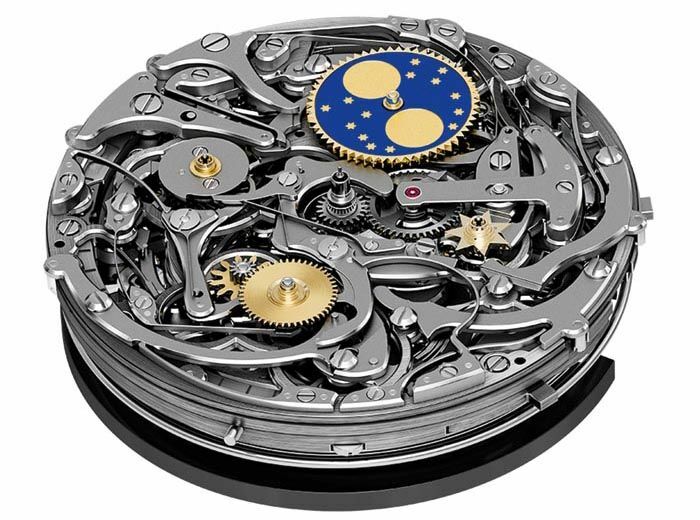 Another example is the finish of the skeleton caliber 2885 movement. Executed by a single artisan, more than 820 hours are being spend on completing this mechanical wonder. The sapphire dial gives a perfect view on the movement, something a watch connoisseur will appreciate at all times. Especially, when the timepiece has this level of finish. Although I personally have a slight preference for the Tradition Tourbillon Minute Repeater Chronograph when it comes to the SIHH 2013 novelties, with both timepieces Audemars Piguet is showing the world what they are capable of.